Description of decorations: The substrate are the combination of rough and fine river sand as base layer. A mixture of various sizes of granite river stones stacked up to imitate a slope on the natural river bank. Mangrove driftwood, Melastoma plant roots and a few of dead leaves were used to decorate and create the scenery of natural wild and submerged forest roots. 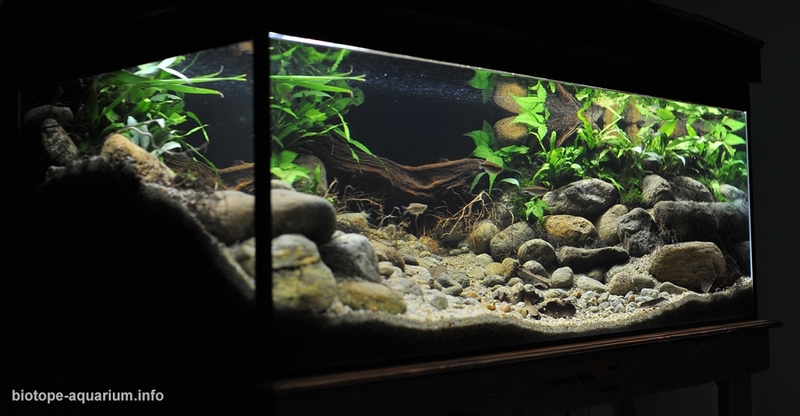 Subsequently, the decoration completed by planting a few types of aquatic plants including mosses which is as same as the actual biotope condition. Description of equipment: – 2 x external filter EJET 3388 (flow pump = 1810LH) + EJET 3368 (flow pump = 1200LH) both loaded with biological and mechanical filter media. The purpose of using 2 filters is to resemble the stream flow and to ensure sufficient dissolved oxygen in the water. – 1x 4ft T5 led lamp 16watt, 6500k with cool daylight effect. 7 hours photo period programmed using digital timer. Water parameters: – Temperature is 25 – 26⁰c, gH is 1, kH is 1, ph 6.7 – 7.3. Ammonia 0.1, Nitrate 0.5. – Reverse osmosis (RO) filtration system used for the aquarium water is to ensure chlorine and threaten heavy metal eliminated from the tab water. 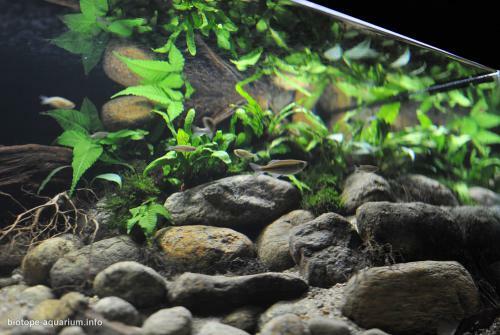 20 – 30% water change performed weekly and gh/kh mineral (magnesium and calcium) added to keep the TDS reading at 30ppm. 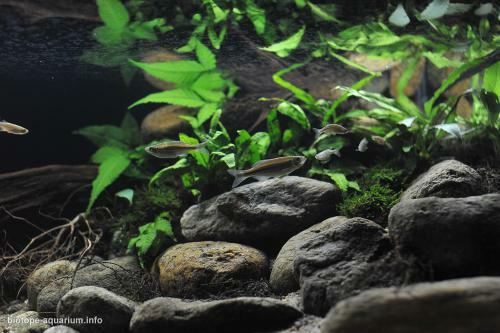 Description of the area surrounding the biotope: Lata Kekabu is a river that flows from Bintang Hijau (Green Star) mountain range in the district of Lenggong, of the mountains valley at the north of Perak, in the Peninsular of Malaysia. Geographically located at 5⁰03’02.3”N 100⁰56’33.8”E and 300 meter above sea level(masl), it is situated 10 kilometers from Lenggong main town. Access to the foothills can be done by public vehicles and to walk through the river requires trekking into the dense forest. Basically, this place is considered as a public recreational spot. However, it is a part of forest reserve area and any particular activities should only be held after getting a permit from the authorities. The average temperature of this area around 26 to 28 degree Celsius depends on the local climate. The environment surrounded is very soothing where the water flows on the rocky stream under dense canopy of tropical rain forest create the shady and cool atmosphere. Some marginal or over-hanging vegetation grow vigorously especially on the well brighten sun ray area. Its well kept ecosystem makes it suitable as habitats to various species of aquatics such as fishes of Cyprinidae family yet also invertebrates. The equatorial climate of Malaysia influences the condition of water flow, volume and turbidity at Lata Kekabu. The southwest monsoon from April to September makes the weather drier with less rain. Hence, the water level will decrease and shallow. Meanwhile, during the northeast monsoon from October to March, the rain fall is higher, caused the water to rise, created a wider, deeper and murky stream. This condition is due to more residues, fallen woods and dead leaves on the flooded jungle area that has drifted together. At this moment, some of the fish species will migrate against the current to the upper side of the river for spawning purpose. Description of the underwater landscape of the biotope: The water flow, volume and turbidity is vary depend on the season. Water depth was 30 – 100cm . The underwater floor consists of substrates of gravel and variably sized rocks. Leaves and dead branches that fall from forest drift and accumulate in shallow areas where the current is slow. The aquatic plants only grow on the shallow river bank. 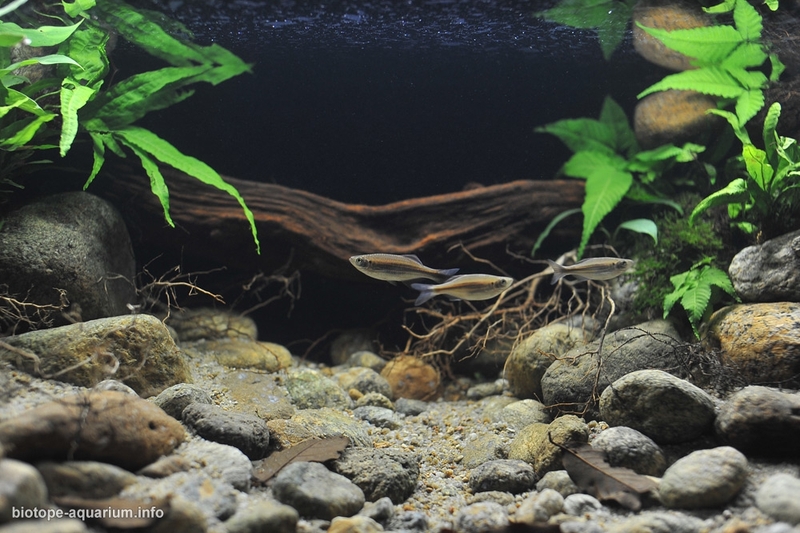 Description of the parameters of the habitat: The water is pristine and well oxygenated at 7.4 – 8.5mg/l-1. The temperature was seasonally variable among 25 – 27⁰c. Water pH also varies from 6.5 to 7.5 depending on season. TDS is 15 – 25ppm. List of fishes and invertebrates occurring in the nature biotope: Devario regina, Danio albolineatus, Homalopteroides smithi, Brotia episcopalis, Clarias leiacanthus, Channa sp, Poropuntius sp, Betta pugnax, Atyopsis moluccensis, Macrobracium malayanum. List of plants found in the nature biotope: – Taxiphyllum barbieri, Monosolenium terenum, Fissiden sp, Piptospatha perakensis, Bolbitis heteroclita Simplicifolia, Microsorum pteropus.